IndyBikehiker: The Last to Arrive? Christmas arrives. Or, we arrive at Christmas--sooner or later. 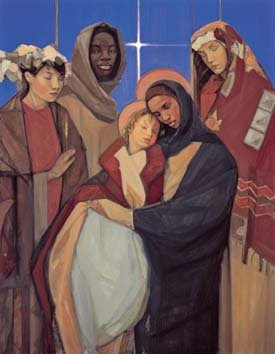 In our faith-formed imagination we are invited to take our place in the Nativity. In this poem, I imagine the unusual and continuing draw of unlikely people to an unlikely place: Bethlehem. arrive, seeking vainly for a room. she gives birth among livestock. just as an angel had told them. from beyond any traceable map. of earth and time, we make our trek. at the gathering in Bethlehem?